We know that ultrasound can be used to diagnose a superficial cutaneous abscess. That is NOT what this study is about. Forget diagnosing! What about actually helping your patients stay out of the emergency department? 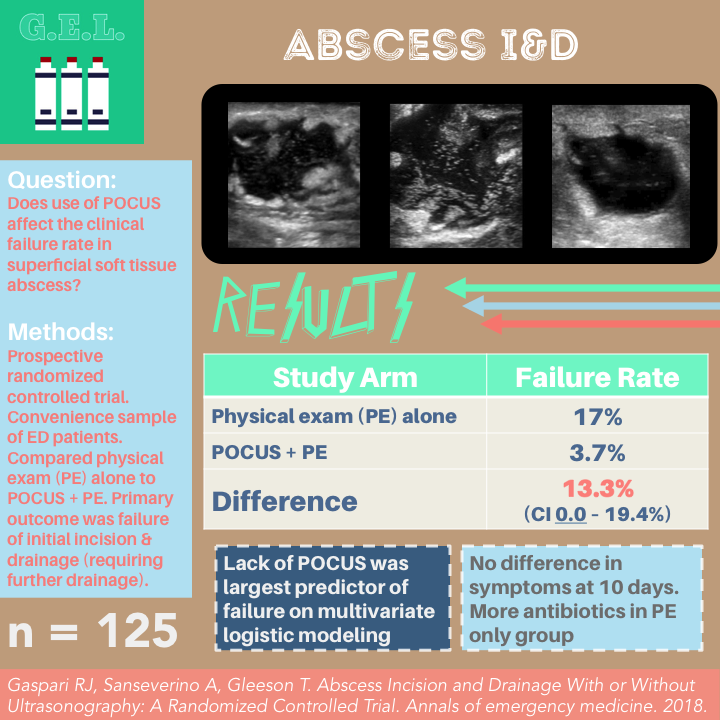 These authors performed this study with the hypothesis that using POCUS during the treatment of a superficial abscess might decrease the failure rate of the incision and drainage. That means ultrasound could help prevent patients from requiring additional treatment! They aren't messing around with retrospective chart reviews either - this is a real live randomized controlled trial. Well the dust has somewhat settled from the initial explosion that this article made when it first hit street corners everywhere. The authors here took on an important question - does point of care ultrasound make a difference in mortality when applied to patients in shock? [SPOILER ALERT] It led to quite a stir when the trial concluded that (I'm paraphrasing here) - "POCUS doesn't help people". Although that conclusion may or may not be the case, this study was a well performed randomized controlled trial. Therefore, you need to know about it and where to go from here. Should I see you round? 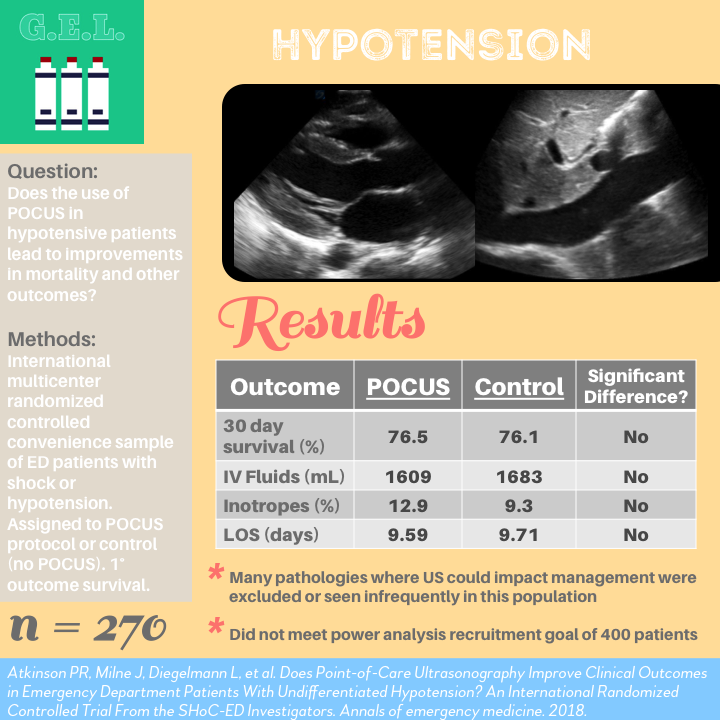 We know that POCUS can be used in making many diagnoses in the critically ill patient. It also can help guide management. So why not perform it every day on every patient? That is the idea behind this article on POCUS rounds in the ICU. These authors compare patients who received a daily POCUS to those who did not - with real patient-centered outcomes! Is it too good to be true? 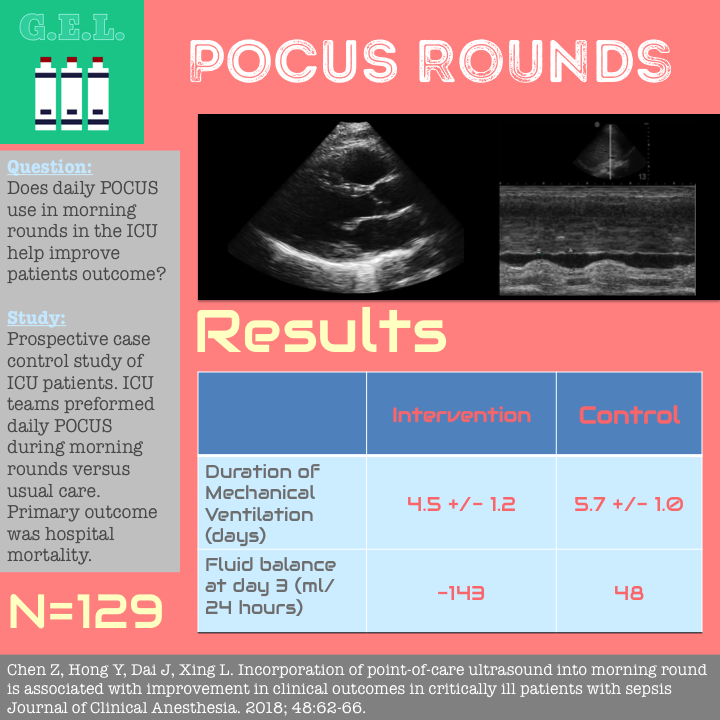 Is a daily POCUS rounds something you should be doing in your ICU?